Having been a regular user of the SmartSound music application since its earliest inception, I have been able to witness its' evolution from an easy to use music program, supplemented by a small collection of music discs and audio FX, to its' current 5.0 version. Sonicfire is now highlighted by an almost massive library of diverse music and the ability to truly customize any audio selection. Its' 'Mood Mapping' feature which I showcased in my review of Sonicfire 4.5 remains and continues to be essential in order to assure that your version of any piece of music is dissimilar to anyone else who might be using the same selection. Sonicfire Pro's ease of use was is what initially attracted so many editors, yet as more features spring up with every version, Sonicfire Pro 5 remains as intuitive as ever. Any individual already having purchased Sonicfire 4 or 4.5 will be entitled to a free upgrade to the Sonicfire Pro 5 Scoring Edition, so if you have made a recent purchase, not to fret, as you didn't throw out your hard earned money on an old version. New customers wishing to get Sonicfire Pro 5 can get the Express Track Edition for Free with any music album purchase. For an extra $99.95 you can upgrade to the Scoring Edition which adds the timeline-based interface that gives you access to Mood Mapping and some newer features like Timing Control and Spotting. The Scoring Edition also includes SmartSound Hit Pack 1 - 46 music & sound effects hit files. The extra features and hit files make it well worth the $99.95 price tag. The big difference between the Express Track Edition and the Scoring Edition is that the Express Edition enables you to quickly choose your music first, precisely select the duration, mood and arrangement almost automatically and export it as a .WAV or. 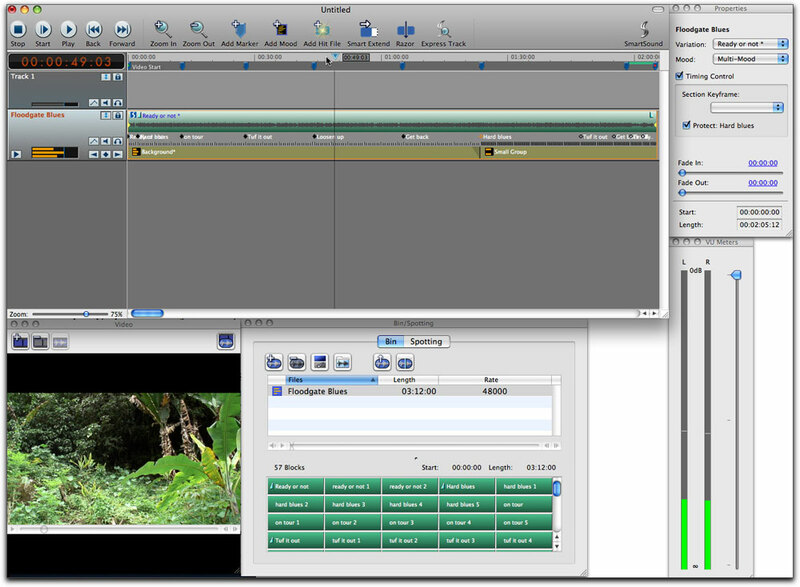 AIFF file to your NLE so that you can then edit to the music. 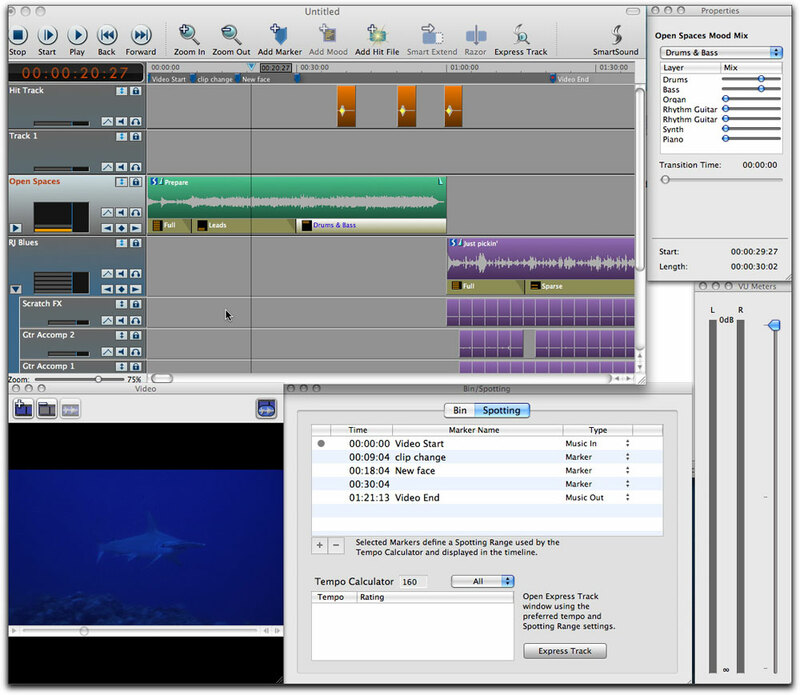 The Scoring Edition, while including the Express Edition, allows you to score your music to the finished video which you can import from your NLE into the video window found in the Sonicfire Pro 5 interface. I believe you will find yourself spending just a bit more time getting things spot on and just right within the Scoring Edition. Here you see the full Sonicfire Pro 5 interface. Note the different 'moods' listed under the 'Prepare' track in the timeline from the SmartSound 'Open Spaces' disc. Look over to the right and you can see the controls where you can add or diminish any instrumentation that makes up the track. Also in the timeline, I have opened the track, 'Just Pickin' from the "All About the Blues" Strata series discs, where I can then move around any of the loops, keyframe the volume of any of the instruments, or take them out altogether. My video has been imported into the lower left window so that I can score the project with exact timing as it progresses. Now that we have that out of the way lets explore some of the new features that can be found in Sonicfire Pro 5. If you are like me, trying to locate the best music for a project is absolutely an imperative part of my editing workflow. As my music library increases, it can become even more difficult to find just the piece I am looking for. Sonicfire 5 helps you find what you need in several ways. As you open up Sonicfire, an Express Track window comes up with a number of easy to navigate choices. For those who have been using previous versions of SmartSound or Sonicfire Pro, the Maestro window is no more. Actually, it is the same but under a different name, 'Express Track'. In the upper left you can select from music pieces among the library you already own, whether you want the piece to be single or multilayered, whether it is a sound effect you are looking for, or even have it search the on-line SmartSound Store for a music selection that you may not already have. Another way to find the piece your project needs is to select a cut by the Style of music and whether you want it to be classical, funny, bluesy, or any number of musical genres. Yet another method of locating a piece is by its' intensity and using the drop down menu in the express track and setting it on 'Intensity'. Sonicfire will search through your library and bring up the cuts by the intensity setting of your choice, either one + or 5+ being the most intense. Heck, there are so many ways to enable Sonicfire 5 to search for just the correct cut, I could spend the entire review explaining it. Suffice to say you can search via instruments, favorite cuts, album titles and more. Here we have the Express Track window, formerly known as the Maestro. It is here where you can search and select the music pieces you are looking for. It opens by default which I prefer, but you can change that in the Sonicfire Pro 5 preferences. Once you have chosen a preferred music selection, type in the duration you want it to be, the variation and/or mood and click 'insert'. That's all you need to do. As my Sonicfire music library increases, I will generally add a particular cut I like to my favorites tab. This is easily done by clicking on the little heart underneath the info/license window on the right of the Express Track interface. This is also a good place to add notes about a specific cut. These notes are also saved. I do wish they had not moved the favorites classification to its new location, however it is still easy to access. Brand new to Sonicfire Pro 5 is the ability to create new tempos to any piece of music you select. Thus, if a piece is 130 BPM and you want it to slow down to 90 BPM, you just need to go to the Tempo box at the bottom of the Express Track window and adjust the tempo. 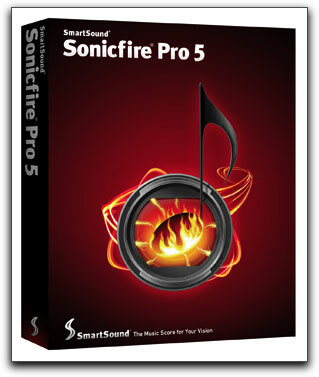 Sonicfire 5 will then create new Sound Files for your modified tempo and store them. These files are stored on your hard drive/ Library/App. Support/SmartSound/Sound Files Modified folder. However, if you wish to delete either the modified tempo of a selected cut or the modified tempos of all your altered pieces, just click on the delete menu item in the same Tempo window and it is done. I tested this several times and it worked like a charm. 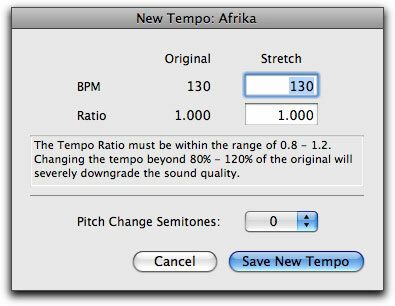 By the way, in the same modify tempo window, you can also change the pitch semitones of any cut up to + or -6. The Tempo Window opens when you want to either change the pitch or tempo of your selection. As it points out, changing the tempo too much may degrade the sound quality. Have good speakers in your editing bay for critical listening. Once you have chosen the music that is right for you, you then select the precise duration of the piece and click on 'insert' which will then insert the music to the timeline. However, lets say the duration you set is off by a few measures, perhaps too long or too short, you can simply grab the end of the piece and drag it to the exact length you want in the Sonicfire timeline. Sonicfire Pro 5 will automatically recalculate the piece and adjust the beginning, middle and end so that it becomes a perfect fit. It really is that simple. But that's not all that is new with Sonicfire Pro 5. Incorporated is an additional feature they call 'Spotting' which benefits you as you set markers for music modifications as they fit different clips, transitions, effects, or mood, however you prefer. Once markers are set, you can go to the 'Spotting' bin which then shows you the preferred tempos of music dependent upon where you set the markers. 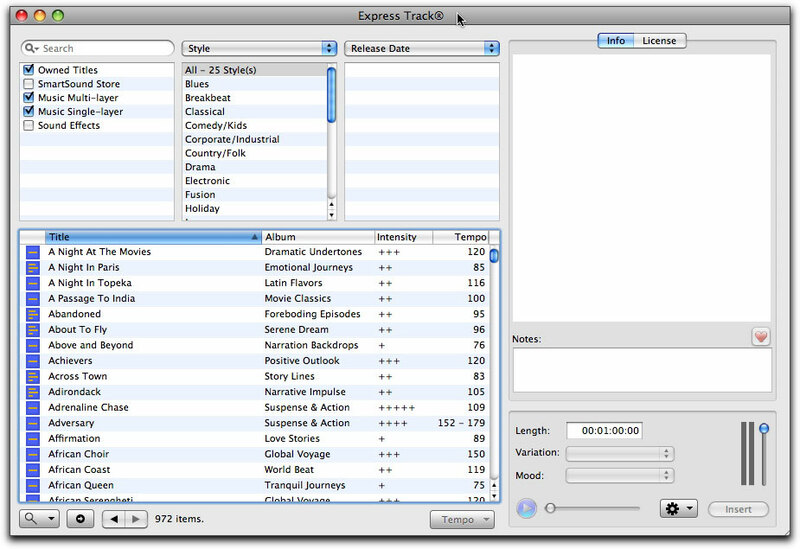 You can choose one of these tempos, double click and it will bring up the Express Track window with suggested tracks. Once inserted into the Sonicfire interface, you can hear how the tempo of the music beats will correspond with the markers/beats of the video. I liked that I can set ins and outs of the music clip with these markers so as to easily switch between cuts and still have them fit perfectly to my video. Even more impressive is Sonicfire's exciting new 'Timing Control', which enables your audio track to reflect the segment changes within your video. Timing control does so much of the work for you it's amazing, and I am surprised that it was a new feature I didn't even notice at first. 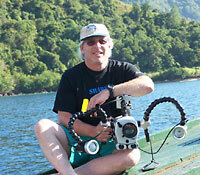 As the focus of your video changes perspective, lets say an establishing shot of a shark cage being lowered into the water and then cutting to the wide eyes of a diver in the cage staring at a hungry looking Great White, you might find it necessary to alter the feel of the music selection you are using. Sonicfire's music has always been made up of blocks of music. Thus, the timing controls alter the arrangement of these blocks to fit the markers you are setting in the music so that each video segment is matched perfectly with the music. Used in conjunction with the Mood Mapping feature you will find that you now possess one very powerful and handy audio tool. With the Timing Control in the Properties window checked, the individual blocks that make up your music selection are shown. These block keyframes can then be moved to your markers so as to custom fit the music to changes in your video. Checking the 'Protect' box, also in the properties window, prevents any timing changes you have made from being accidently moved. When using the time control feature, it is best to make your changes from the beginning of your video sequence as opposed to moving from right to left. For me, what is most important is that the choice of music tracks, whether bought individually via the SmartSound website or by the disc, increases in quality with almost every new collection. I was able to audition several new music discs which are titled by theme. 'Open Road', 'Nature Trails', 'Narrative Impulse', 'Serene Dream', and 'Indie Band 02' pleased me tremendously with their very real instrumentation and diversity of cuts within each disc's theme. Another disc, 'All About the Blues', brought thoughts of Muddy Waters, B.B.King, and Robert Johnson to my head, really excellent cuts that would make any owner happy to have them. Any of these, and other SmartSound discs, can be previewed on line before purchase which ensures that you won't feel as if you bought a whole disc and could only use one cut. So, what's my bottom line for Sonicfire Pro 5? By now, you can probably tell that no one can accuse me of not being enthusiastic enough. While it may take you some time to build up a library to suit all your musical needs, it will take you very little time to learn how to use Sonicfire Pro 5. The learning curve is almost nil, however, to help you along, the folk at SmartSound have put up several excellent video tutorials on their website. I watched a few of them, by Larry Jordan, and all were very well scripted and produced. I just don't think you can go wrong with Sonicfire Pro 5, and truly wonder what features they will come up with next.